Acapulco is located in the Mexican state of Guerrero and is one the country's most important tourist destinations since the 1930s. Its boom started in the 1950s when it became synonymous of grand tourism. Rich and famous people from all around the world have walked its beaches and stayed in its hotels, including the European royalty, world cinema actors, and famous athletes. Acapulco is a major Mexican port on the Pacific Ocean and has two bays: Santa Lucía, better known as Acapulco Bay, and Puerto Marqués. Both are famous for its impressive cliffs, golden sand beaches, and tropical vegetation. Water sports enthusiasts will find a paradise with various options that include night diving and children's diving. 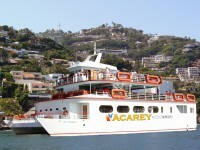 The social life of the city takes place in the port of Acapulco. Costera Miguel Aleman Avenue, which runs along the bay, houses the hotel zone, shops, restaurants, and nightclubs. La Costera, as it is usually known, has given Acapulco its reputation as a city that never sleeps. Revolcadero Beach, south of the city, is ideal for surfing due to its abundant waves. Punta Diamante, an ambitious tourism project comprising luxury hotels, Spas, restaurants, shopping areas, and a golf course, is located between Acapulco Bay and the airport. La Roqueta Island is another important tourist attraction of Acapulco, reachable by boat from the beaches of Caleta and Caletilla, in the heart of Old Acapulco. On the way to the island, the glass bottom boats allow tourists to observe the submerged statue of the Virgin of the Seas, patron saint of fishermen. There is a lighthouse and a zoo on the island, where you can also practice snorkeling and diving. The cliff known as La Quebrada has been one of the biggest attractions in Acapulco since 1934. The natives have learned to jump dive from the top in a free fall of 45 meters (148 ft) into the sea without any professional training. There is a public viewpoint from where you can watch this in exchange for a tip for the brave divers. Acapulco is a versatile destination with places to party, intimate corners, and spaces for families, such as Papagayo Park, an ecological reserve with a skating rink, a library, and three artificial lakes.